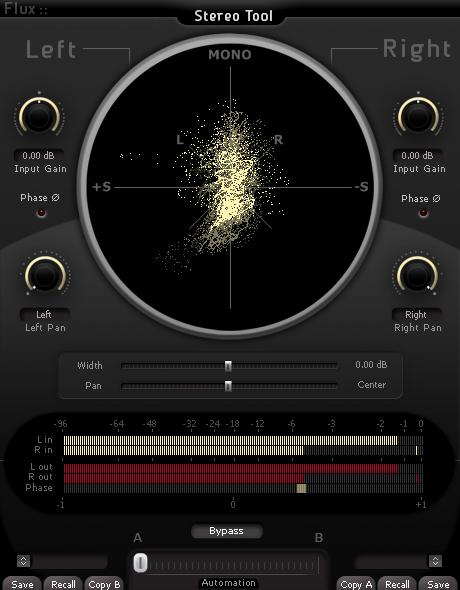 BREVERB offers high-quality musical reverb processing with a flexibility previously available only in extremely expensive hardware reverbs. BREVERB is also engineered to achieve the highest levels of musicality helping you to place it perfectly in any mix. Unlike convolution reverbs (a reverb that reproduces the real impulse response of a real hall) which recently have gained a lot of popularity, BREVERB allows you to vary the nature of reverberation through several parameters, giving you the flexibility and real-time feedback that has always been a prerogative of the most famous studio digital reverbs. I will do a full review on the BREVERB very soon including actual mix use. "Nintendo’s next generation Wii console — currently codenamed “Project Cafe” — could land later this year, and it may sport a new controller with a touchscreen display. A user in the NeoGaf forums has posted several images that provide additional details on Nintendo’s rumored system. 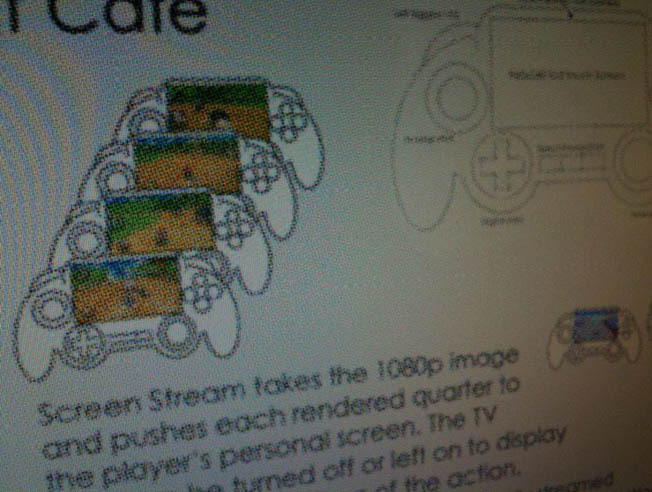 According to the photos, “Screen Stream takes the 1080p image and pushes each rendered quarter to the player’s personal TV screen,” which is on the controller itself. So if you’re partaking in a four-player game, for example, you’ll be able to view your slice of the HDTV screen directly on your controller. Similarly, we imagine instances where a gamer could manage his or her character’s traits or abilities directly from the controller itself, without having to pause the game for everyone to access game menu options. IGN says the Nintendo Wii 2 will likely cost between $350 and $400, will offer 1080p output with possible support for stereoscopic 3D, and will run a newer version of AMD’s R700 GPU"
Stereo enhancement plugins are great mixing tools but can cause issues with your mix if used improperly. 1. Always check the mix in mono as stereo wideners wreak havoc on phase. Pay special attention to the low end as it can sound thin and lack punch when the stereo enhancer is improperly set. 2. Use the stereo widener on individual sounds or aux/group busses. I'm not a big fan of using stereo enhancement on the 2-buss/master (but if you do remember tip #1). 3. Use stereo wideners sparingly. Less is more. The contrast between the mono, slightly panned and wide elements is what creates the illusion of a super wide mix. Don't widen every sound just the ones that make the mix interesting. 4. Experiment with using stereo wideners on the efx returns instead of the direct sounds. You can use more drastic settings without the direct sounds losing presence or mono compatibility. LEFT (hard left) -RIGHT (slightly right of center) and RIGHT (hard right)- LEFT (slightly left of center). Experiment with different panpot settings to hear what works best for the song. 7. 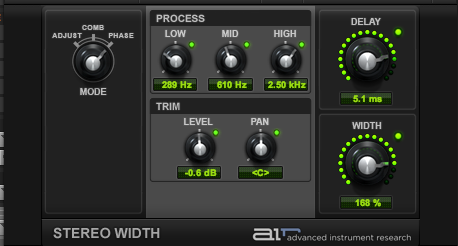 Use EQ to make your sounds appear wider by eq'ing the left and right sides differently. If you boost certain frequencies on the left cut them on the right and vice versa. Make sure to listen and adjust for level differences. I've used this trick many times when mixing on an analog board. 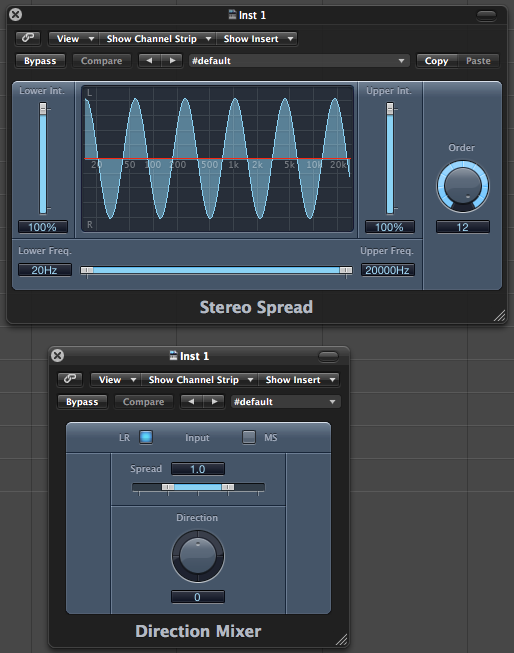 It's also a great way to create pseudo stereo sounds out of a mono signal. 8. Use chorus, phasers, short delays etc. to widen the stereo image. This works great on vocals and lead instruments. Pay special attention to the delay parameters a small difference in the left and right delay times can make a huge difference in perceived wideness of a sound. 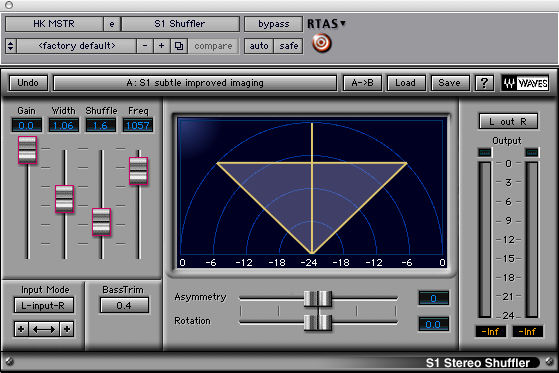 Most DAWs have stereo enhancers as part of their stock plug-in set (Protools' Air Stereo Width, Logic Pro's Stereo Spread and Direction Mixer pictured above) but one of the most well known is the S1 Imager from Waves Audio. 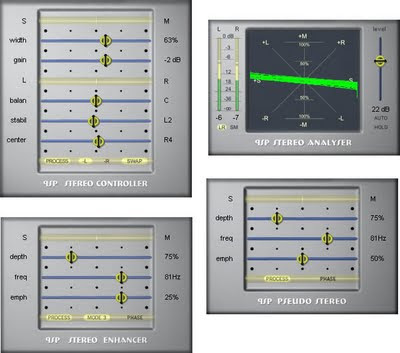 There are other stereo enhancers such as Brainworx bx_solo, Flux Stereo Tool (both of which are free) PSP StereoPack and DrMS Spatial Processor plugins. As far as hardware enhancers go two of my favorites are the SPL Classic Vitalizer (there's also SPL's high-end Tube Vitalizer which is available as a plugin) and the Behringer Edison. I've used both of these units on many mixes in the past. Another great hardware stereo enhancer is the SRS MW-02 MegaWide Processor. The SPL Vitalizer, Behringer Edison and SRS MegaWide are discontinued but can be found on Ebay. A great feature of both the SPL and SRS units are the bass controls which allows you to shape or contour the low end and controls to enhamce the midrange clarity in addition to enhancing the stereo image. The Edison has a built in Phase meter and a Center Distance control which allows you to change the depth of central elements in the mix such as the lead vocal. If you come up with a new/different way of enhancing your stereo sounds feel free to post it in the comments. I will add it to the blog and credit the author. Police knew about, used iPhone tracking logs. "Law enforcement agencies have known since at least last year that an iPhone or iPad surreptitiously records its owner's approximate location, and have used that geolocation data to aid criminal investigations. At least some phones running Google's Android OS also store location information, Swedish programer Magnus Eriksson told CNET today. And research by another security analyst suggests that "virtually all Android devices" send some of those coordinates back to Google." 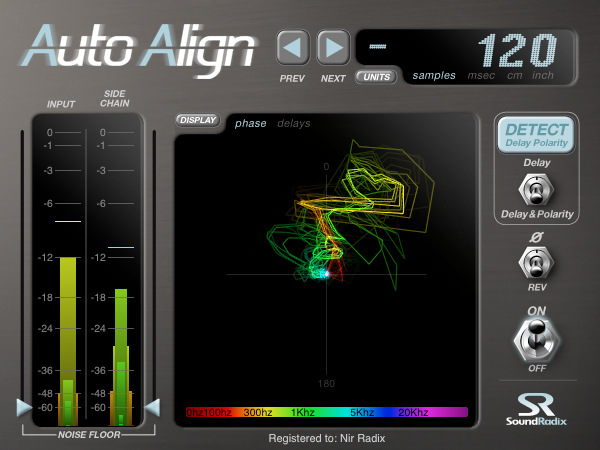 Sound Radix Auto-Align is an automatic microphone time alignment plug-in. Time-aligning a multi-microphone setup is crucial to achieve coherent and punchier sound. When recording an instrument with more then one mic, sound tends to reach each microphone at a slightly different time and thus cause some frequencies to cancel each-other while other frequencies can build-up unnaturally. 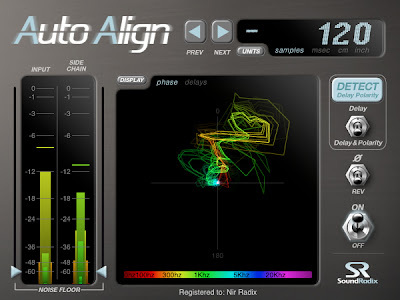 Auto-Align will "listen" to your multi-mic recording and will automatically measure and compensate for the delay between the microphones - sample accurate. When distant microphones are used and a delay is desired to preserve a sense of space, Auto-Align can time-place the microphones to better match the close-mic'ed source.